This article is about the traditional food made with pork blood. For the fictional creature, see Black pudding (Dungeons & Dragons). 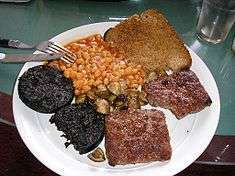 A Scottish cooked breakfast, including black pudding, served with Scottish square sausage, baked beans, mushrooms, and fried bread. A single battered deep-fried chip shop black pudding (approx. 20 cm (7.9 in) long), sliced open. Black pudding[note 1] is a type of blood sausage commonly eaten in Great Britain, Ireland and in other parts of Europe. [note 2] It is generally made from pork fat or beef suet, pork blood and a relatively high proportion of oatmeal, in some recipes mixed with oat groats and sometimes even barley groats. Black pudding pre-sliced may still have a plastic wrap around the circumference that must be removed before cooking. 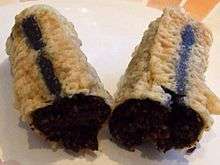 Black pudding is often grilled, fried, baked or boiled in its skin. It can be eaten cold as it is cooked in production. It was occasionally flavoured with pennyroyal, differing from continental European versions in its relatively limited range of ingredients and reliance on oatmeal and barley instead of onions or chitterlings to absorb and be mixed with the blood. In the United Kingdom, black pudding is considered a delicacy in the Black Country, the West Midlands, Stornoway, the North West, and especially in Greater Manchester (in towns such as Bury), where it is traditionally boiled and served with malt vinegar out of paper wrapping. The Stornoway black pudding, made in the Western Isles of Scotland, has been granted Protected Geographical Indicator of Origin status. In the wake of this designation, butchers in Bury sought to demonstrate their history of manufacturing and selling the product. One such claim dates back to 1810. In Scotland and the north of England, chip shops commonly sell black pudding battered and deep-fried. Prepared in this way, it is eaten as a meal with chips, replacing the better-known battered fish. Novel culinary uses for black pudding include black pudding ice cream, while perhaps more conventional modern recipes include using it as an accompaniment to pigeon or scallops. Black pudding is a good source of protein, is low in carbohydrate and high in zinc and iron but is also high in saturated fat and cholesterol. Since the 1980s, the World Black Pudding Throwing Championships has been held in Ramsbottom. The humorous competition invokes the traditional Lancashire – Yorkshire rivalry, with participants throwing the black puddings at piles of Yorkshire puddings. It takes place annually in September, and draws thousands of competitors and spectators to the town. In past years the Bacup Food and Black Pudding Festival has been held in Bacup. ↑ Swedish: blodpudding, Low German: Bloodballen, Estonian: verivorst, Finnish: mustamakkara, French: boudin noir, Luxembourgish: Träipen, Spanish: morcilla and Portuguese: morcela. ↑ Black pudding is also eaten along the North Sea coastal regions of Fryslan and Drente (both Netherlands), in Lower Saxony from Ostfriesland to Bremen and Hamburg and Schleswig-Holstein mostly Nordfriesland, France, Slovenia, Italy, Finland, Luxembourg, Croatia, Hungary, Poland, Ireland, Sweden, Estonia, Spain, Portugal, Argentina, Latvia and Lithuania. Wikimedia Commons has media related to Black pudding. ↑ "The Black Pudding". The English Breakfast Society. Retrieved 2014-01-06. ↑ Paul Britton (2013-01-10). "Proof of black pudding's birthplace is back home in Bury". Manchester Evening News. Retrieved 2016-03-12. ↑ "Marystown man enjoys making traditional Newfoundland fare". Southern Gazette. 2008-10-15. Retrieved 2016-10-01. 1 2 "Black pudding ice cream unveiled". 2005-08-26. Retrieved 2016-03-21. ↑ "Gordon Ramsay prepares pigeon salad, black pudding and pancetta - The F Word". Retrieved 2016-03-21. ↑ "BBC Food: Scallops with bacon, black pudding and colcannon". Retrieved 2016-09-30. ↑ "Blood sausage – Nutrition Facts". SELFNutritionData. Retrieved 7 January 2016. ↑ "Ramsbottom World Black Pudding Throwing Championships". Retrieved 2016-03-12. ↑ Paul Britton (2015-09-07). "The World Black Pudding Throwing Championships return to Ramsbottom on Sunday". Manchester Evening News. Retrieved 2016-03-12. ↑ Dan O'Donoghue (2015-09-14). "PICTURES: Thousands flock to Ramsbottom for World Black Pudding Throwing Championships". Rossendale Free Press. Retrieved 2016-03-21. ↑ Samrana Hussain. "A crack at world record". Lancashire Telegraph. Retrieved 2016-03-21. ↑ Paul Vallely (2011-11-19). "Great Scotch! Manchester's take on the Scotch egg has become a snack sensation". The Independent. Retrieved 2016-03-21. ↑ Tom Brooks-Pollock (2011-09-24). "Scrambling for a new taste sensation - the Manchester Egg". Manchester Evening News. Retrieved 2016-03-21. ↑ "Manchester egg recipe". The Telegraph. Retrieved 2016-03-21.